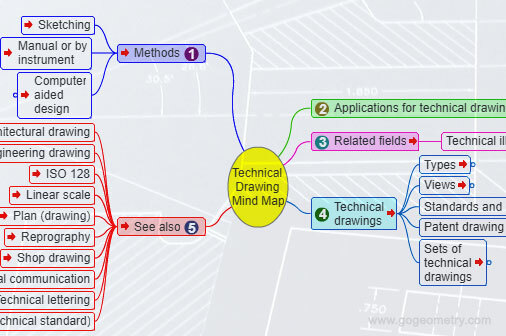 Technical Drawings Interactive Mind Map, Education. Interactive Mind Map that represents connections between various topics and concepts related to Technical Drawing. Source: Wikipedia: Technical Drawing. Technical drawing is the act and discipline of creating drawings that visually communicate how something functions or is constructed. ISO 128 is an international standard, about the general principles of presentation in technical drawings.